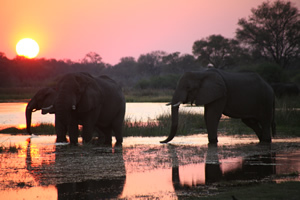 Take in the beauty of Botswana with Travel Adventures Botswana’s Elephant Route. This Botswana Self drive safari route has been carefully pre-costed and put together by the very experience guides at Travel Adventures Botswana to allow you to enjoy the full Botswana self drive safari experience with out the stress of having to plot your own route. 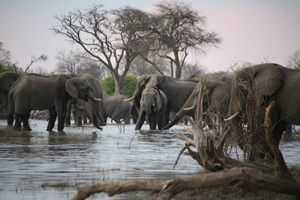 Starting in Kasane, the Elephant Route self drive safari will take you on an extensive 10 day voyage through the heart of both Chobe and Moreni Game Reserves before bringing you safely back to your drop off point in Maun. Should you decide that 10 days is simply not enough time to absorb the incredibly diverse and wild environment, Travel Adventures offer a choice of extensions to the Elephant Route. Extension 1 adds another 5 days to your trip and takes you from Maun to Kubu Island, the Mkgadikgadi pans and Khumaga. Experience the stark contrast to Chobe and Moreni in this arid and seemingly barren world, explore the pans, and view the majestic baobabs before returning to Maun and taking your homeward trip. The alternative extension to the Elephant Route, extension 2 will take you on your Botswana self drive safari into the Central Kalahari Game park for 3 days of camping and game viewing before moving on to Khumaga and finally back to Maun for your flight home. 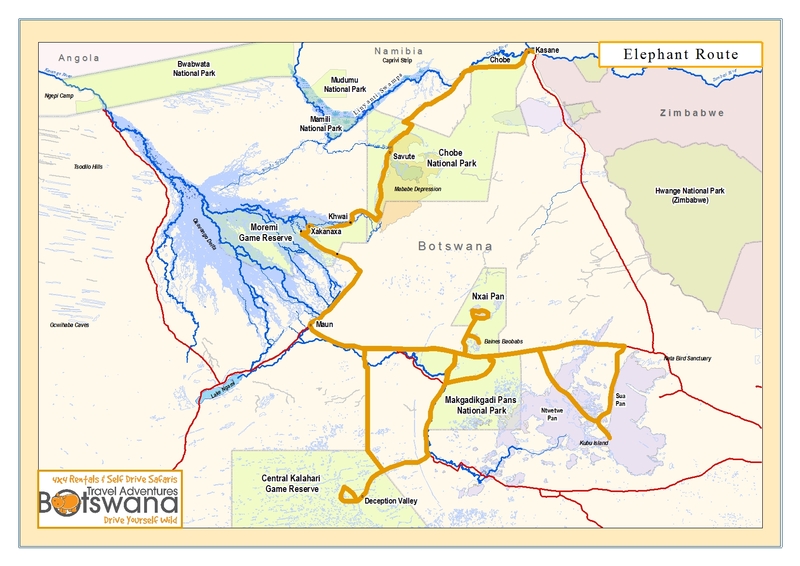 To have a look at the full itinerary and rates you can download the Elephant Route pdf, or alternatively you can contact Travel Adventures Botswana directly by clicking here.